The ARISS contact Friday 21 september 2018 at 10:15:22 UTC of Alexander Gerst KF5ONO with Bischöfliche Schule and Technisches Institut, St. Vith, Belgium, and Berufliche Schule Direktorat 1 Nürnberg, Nürnberg, Germany was a successful. The amateur radio contact with NA1SS was a telebridge via W6SRJ the ARISS ground station at Santa Rosa Jr. College, CA, USA. Stefan ON6TI leads the conversations between Alexander Gerst KF5ONO and the schools in St-Vith and Nürenberg. 130 students were present in the auditorium of Bischöflichen Schule in St-Vith, almost 100 students in the auditorium of Berufliche Schule Direktorat 1 Nürnberg in Nürnberg, Germany, 12 questions were answered by Alexander Gerst. Stephan, DL1STV coordinated the activity in Nürnberg. 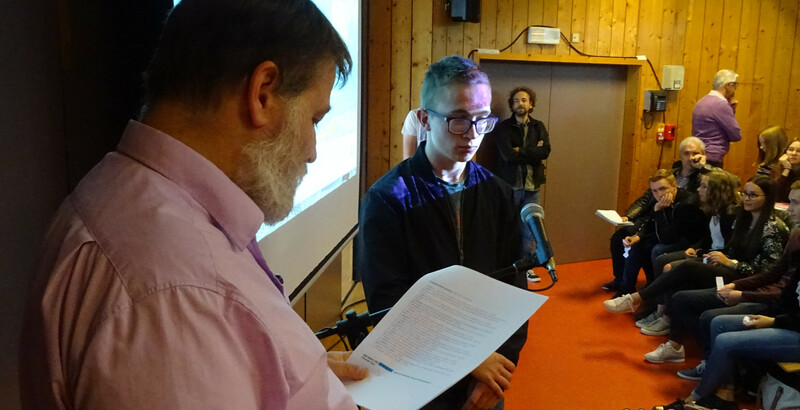 Stefan, ON6TI, organized the contact from St-Vith and spoke afterwards to the press. The BRF (Belgian german-speaking channel) did cover the event on TV and made afterwards individual interviews with students and teachers. The regional press reported on it.